This is a story that I've been reporting pieces of for a number of years. The bottom line is that China claims that, for historical reasons, all of the islands in the South China Sea are part of Chinese territory, just as if they were part of the Chinese mainland. The blue line demarcates the region claimed by China to be sovereign Chinese territory. There are some 200 islands in the huge region claimed by China, some of them submerged or very tiny. The major groups are the Paracel Islands (Xisha in Chinese) and the Spratly Islands (Nansha in Chinese). China is claiming that its sovereign maritime border is 200 nautical miles out, not the traditional 12 miles. This claim is in contradiction to the United Nations Convention on the Law of the Sea (UNCLOS). This gives China sovereignty over many islands and reefs in the South China Sea. China then claims that all these islands and reefs are Chinese territory. Therefore, China claims that they can further extend their maritime border another 200 milies beyond these islands and reefs. The result is that China claims that its territorial borders extend more than 1,000 miles from the Chinese mainland. In consequence, China claims that any foreign ships passing through the South China Sea must agree to numerous restrictions, and military ships are forbidden altogether without permission of the Chinese government. You can see that is an incredible claim by the Chinese, and is a disaster waiting to happen. The article notes the following: "To demonstrate the drastic impact of China's inflated claims, one needs only to examine what America's territorial boundaries would be like if Washington used the same interpretations of UNCLOS that China uses. In that scenario, the United States could claim a maritime border from the coast of California west past the Hawaiian Islands all the way to Guam; from Alaska and the Aleutian islands in the north; south to Howland, Baker, and Jarvis islands on the equator. Virtually the entire northern Pacific would be American 'internal waters.'" Of course, the U.S. objects to any restrictions on U.S. ships traversing the South China Sea, but other countries in the region reject China's claims entirely. Vietnam, Taiwan, Malaysia, Philippines and Brunei all claim some of the islands of the South China Sea. The United States has not taken a position on conflicting sovereignty claims in the South China Sea, but insists that passage through the South China Sea must remain open to all nations. This whole subject area is a sign of China's increasingly imperialistic direction. The Chinese surely understand that their position would never be tolerated by the United States, by any of the five other countries that lay claim to the islands, or even most of the world. The fact that they would have laid such claims in the 1990s, and have continued to hold them, can only mean that they're envisioning a time when they take control of the entire South China Sea region using military force, and that they expect to win. All of the above was true in 2001, when the article was written. Since that time, China has not retracted any of these claims. The difference today is that the Chinese military is increasingly able to enforce these claims, according to Global Post. The claims go beyond national pride, according to the article. The South China Sea has untapped oil and natural gas reserves, and so the region has high strategic value. China reportedly threatened U.S. energy firm ExxonMobil with retaliation if it continued oil exploration off Vietnam in waters China considers its own. Chinese military vessels harassed U.S. surveillance ships in the sea last year. China built up a small military presence in the Spratlys, and boarded and seized Vietnamese fishing boats in the area. China is building a massive naval base on the island of Hainan Dao (see above map). The base will house China's new nuclear-armed submarines, as well as its first aircraft carrier, expected to enter service by 2012, and many other warships. China has recently escalated its dialog on the subject. Early in June, at an international security conference in Singapore known as the "Shangri-La Dialogue," General Ma Xiaotian Deputy Chief of General Staff of China's People�s Liberation Army, had a Q & A session at which he defined maritime security in the region as one of China's "core interests." This is a code phrase that puts China's claims to the South China Sea on a par with their claims to Taiwan and Tibet. This is an extremely serious developing problem. China has made it clear that it would not tolerate any interference in Tibet or Taiwan, and now they appear to be extending that claim to the entire South China Sea. China has literally a thousand missiles aimed at Taiwan and as I've said many times, we could be at war with China in 24 hours. All that would be needed is for the Taiwan people or government to take some action that the paranoid Beijing government views as moving towards independence. The Chinese would launch an attack on Taiwan, and we would respond within a few hours. The possibilities of a war through miscalculation in the South China Sea are growing. Singapore, Malaysia and Vietnam have all deployed submarines in the South China Sea, often with crews that are unfamiliar with rules for the underwater right of way. An accident involving Chinese submarines is a real possibility. Ironically, 40 years after the Vietnam War, the South China Sea dispute is strengthening the U.S. relationship with Vietnam, something that makes the paranoid Beijing feel even more threatened. 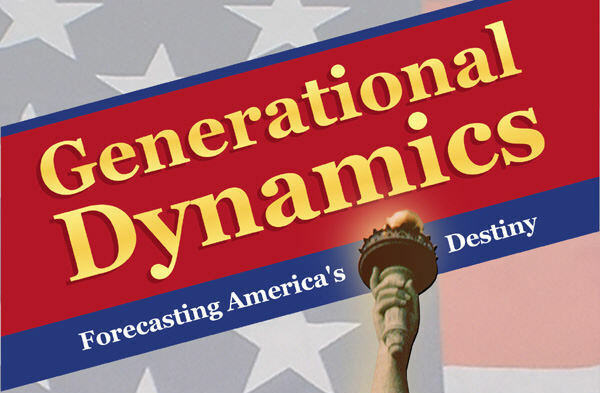 From the point of view of Generational Dynamics, we're headed for a war with China with absolutely certainty. In the past, I've said that it might begin with a war over Taiwan or with a war between China and Japan, or with a war between India and Pakistan. The unrest in Kyrgyzstan could spiral into a larger war that draws in both China and the U.S., and now we see that a war could begin in the South China Sea. We know that China is spending enormous amounts of money on its military in preparation for a war with the U.S. The only thing that we don't know is when China plans to begin the war. The Sunday morning news talk shows were a-twitter about the war in Afghanistan and the firing of General Stanley McChrystal, replacing him with Gen. David Petraeus. CIA Director Leon Panetta was interviewed on ABC News This Week, and although he did his best to put a good face on progress on the war, a lot of what he said was very gloomy. "You know, I read all the same stories, we get intelligence along those lines, but the bottom line is that we really have not seen any firm intelligence that there's a real interest among the Taliban, the militant allies of Al Qaida, Al Qaida itself, the Haqqanis, TTP, other militant groups. We have seen no evidence that they are truly interested in reconciliation, where they would surrender their arms, where they would denounce Al Qaida, where they would really try to become part of that society. We've seen no evidence of that and very frankly, my view is that with regards to reconciliation, unless they're convinced that the United States is going to win and that they're going to be defeated, I think it's very difficult to proceed with a reconciliation that's going to be meaningful." This is a particularly negative statement in view of the Administration commitment to start withdrawing troops from Afghanistan in July, 2011. It means that no negotiated end is possible, and that the Nato forces have a little over a year to defeat the Taliban. But of course the Taliban know that the Americans are going to withdraw in a year, so they'll just wait and take over when the time comes. The strategy is to get the Afghan people to turn on the Taliban, as the Iraqi people turned against Al-Qaeda in Iraq, but that doesn't make sense in Afghanistan. The Taliban are Pashtuns, and the people living in the south of Afghanistan are Pashtuns, and they won't turn against their brothers, particularly when they just fought an extremely bloody crisis civil war with other Afghan ethnic groups during the 1990s. "It strikes me from listening to what we have heard this past week and the underlying debate that was taking place before General McChrystal was dismissed that the general's timeline and the politicians' time lines are very different. President Obama has got a big reason to want to begin to withdraw, even if it's a small withdrawal, by next summer. There's an election that follows here in a few months after that. But at the same time, anybody who has done counterinsurgency work in the military tells you the same thing which is counterinsurgency is taking a decade or more. That was the British experience in Malaysia. It's been the experience in many other countries. And certainly if you look at what Director Panetta said today about how the Taliban are not yet facing any incentive to reach reconciliation, it tells you that it would take a much longer time. And I think that's the fundamental issue. You know, the president said he doesn't mind dissent, he can't stand division. Firing General McChrystal I think only submerged the dissent. It is going to come back when this review takes place in December of the overall policy." "Absolutely. And I think that one of the challenges is it's not when they do the review in December, they have to look at what can they accomplish in the remaining six months and the fact is, this is Afghanistan, this is not Iraq. This is a place where you don't have a middle class. You don't have a lot of literacy even among the army and the police you're trying to recruit. The tribal structure, we relied in Iraq on the tribes to be the ones we could recruit to turn against al Qaeda. In Afghanistan, they have been decimated first by the decade-long war with the Soviet Union by the war lords and the civil war afterwards, and by the Taliban. And so you don't have the kind of network that you can turn in your favor to help lure, either defeat the Taliban or lure the Taliban in. And so the obstacles we face with just a year left in the cycle are truly daunting. And it's very hard to see how we can be very successful." "I think his policy is the right policy. I think General Petraeus, who�s the originator of a counterinsurgency policy and where your goal is to protect the population basically, so that the population will turn on the Taliban, not support the Taliban, work with the Afghan National Army, which is so critical here. I think that�s the right policy. It was the Petraeus policy. McChrystal supported that policy. Petraeus has said publicly and privately to me that he agrees with both pieces of this policy, which was the additional troops but also setting a date of July, 2011, as a way of showing urgency to the Afghan government that they must take responsibility through their army mainly for their own security because the Afghan army is the Taliban�s greatest nightmare." This is a total fantasy, as can be seen from the fact that it contradicts what Sanger and Wright said earlier. There is no chance at all that "the population will turn on the Taliban." Levin is very close to the Obama Administration, and if what he's saying reflects the views of Obama and his staff, then they are in a great deal of trouble. On the CNN show, Reliable Sources, Howard Kurtz interviewed Michael Hastings, who had written the Rolling Stone article that got General Stanley McChrystal fired. Hastings is a far left guy, and even during this interview, Kurtz asked him about his previous statements: "You talked about Rudy Giuliani is a maniac, and you wanted to save America from the horror of a President Giuliani. And you talked about John McCain as Captain Ahab." Hastings' response was "I didn't know thinking Rudy Giuliani was a maniac was exclusive to the far left." Hastings was asked whether the stuff he quoted was off the record. He replied: "[W]hen I go in to write a profile, and no ground rules are laid down, and I'm there to write an on-the- record profile and cover readings while in the room, then that means it's on the record. I mean, it's not much of a mystery. If someone tells you something is off the record, I don't print it. If they don't tell me something is off the record, then it's fair game." "Michael Hastings, if you believe him, says that there were no ground rules laid out. And, I mean, that just doesn't really make a lot of sense to me, because if you look at the people around General McChrystal, if you look at his history, he was the Joint Special Operations commander. He has a history of not interacting with the media at all. And his chief of intelligence, Mike Flynn, is the same. I mean, I know these people. They never let their guard down like that. To me, something doesn't add up here. I just -- I don't believe it." I personally have no difficulty believing that Logan is far more credible than Hastings. LOGAN: Yes, absolutely. There is an element of trust. And what I find is the most telling thing about what Michael Hastings said in your interview is that he talked about his manner as pretending to build an illusion of trust and, you know, he's laid out there what his game is. That is exactly the kind of damaging type of attitude that makes it difficult for reporters who are genuine about what they do, who don't -- I don't go around in my personal life pretending to be one thing and then being something else. I mean, I find it egregious that anyone would do that in their professional life. And, I mean, I take that to the point of, even when I plan to interview someone about something difficult, and they want to know the areas of the interview, I might not say, well, we're going to spend the whole interview on this, but I will list that. I will list that controversial issue. KURTZ: Because you don't want to blindside them. LOGAN: Because I don't believe in that. KURTZ: But don't beat reporters -- aren't they nice to people to gain their confidence, and sometimes they have to write things that are not flattering? LOGAN: Of course. I mean, the military is a good example. I have never been -- they never know what to do with me because I've never been accused of being right wing. And they want to paint me as left wing because they expect the media to be that way. But, if you look at my body of work, it's been always been accurate and fair. Now, Michael Hastings might look at my body of work and say, well, there's an example of another one of those reporters, unlike me, that didn't go and tell the truth because they wanted to come back. That's not the case at all. KURTZ: He says that all of the things that have been written about Stanley McChrystal have been these glowing profiles. He's suggesting that he did a job that the regular beat journalists have not done. LOGAN: I think that's insulting and arrogant, myself. I really do, because there are very good beat reporters who have been covering these wars for years, year after year. Michael Hastings appeared in Baghdad fairly late on the scene, and he was there for a significant period of time. He has his credentials, but he's not the only one. There are a lot of very good reporters out there. And to be fair to the military, if they believe that a piece is balanced, they will let you back. They may not have loved it. They didn't love the piece I did about hand grenades being thrown in Iraq that were killing troops. They didn't love that piece, it made a lot of people very angry. They didn't block me from coming back. KURTZ: "The Washington Post" quoted an unnamed senior military official as saying that Michael Hastings broke the off-the-record ground rules. But the person who said this was on background and wouldn't allow his name to be used. LOGAN: Well, it's Kryptonite right now. I mean, do you blame him? The commanding general in Afghanistan just lost his job. Who else is going to lose his job? Believe me, all the senior leadership in Afghanistan are waiting for the ax to fall. I've been speaking to some of them. They don't know who is going to stay and who is going to go. I mean, the question is, really, is what General McChrystal and his aides are doing so egregious, that they deserved to end a career like McChrystal's? I mean, Michael Hastings has never served his country the way McChrystal has. KURTZ: Is this going to prompt the military, in general, the commanders in Afghanistan in particular, to be more wary of journalists? LOGAN: Of course, because what you see is not what you get. Clearly, you've got someone who is making friends with you, pretending to be sympathetic, pretending to be something that they're not, and then they're taking what you say -- when you start an article with General McChrystal making obscene gestures, you're not even using something that he said. And "Rolling Stone" magazine put their own spin on this. They said that the greatest enemy for McChrystal is the wimps in Washington. Nowhere in the article does McChrystal refer to "the wimps in Washington." That's "Rolling Stone" magazine, how they chose to cast this, to make it as sensational as possible. And that was with intent." I've quoted Logan at length because I think what she said is important in terms of understanding people like David Hastings and the loony left. I've pointed out before that during the Bush administrations, news organizations like the New York Times and NBC News were committed to using their power to cause America to be humiliated and defeated in Iraq. What Logan's analysis shows is that nothing has changed with the Obama administration. Hastings and Rolling Stone did a hatchet job on General McChrystal and his staff with the purpose of humiliating these public servants, whom he undoubtedly despises. A lot of people are saying that General McChrystal is an American hero, and I agree with them. As one commentator on Fox News put it, "For General McChrystal to go down like this because of a weasel like Hastings is disgusting." These guys are still completely in the tank for Barack Obama. During the Bush Administration, these guys would have called this firing a major scandal and a sign of desperation. 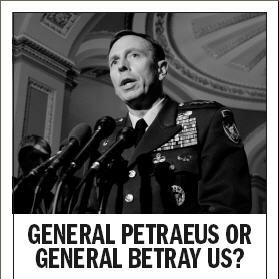 It's a good time to remember that in 2007 the left was calling General Petraeus a traitor. How things have changed.